For the indoor bicycle sport with a format similar to ballet or gymnastics, see Artistic cycling. For the indoor bicycle sport with a format similar to football, see Cycle ball. For bicycle racing on banked indoor circuits, see Track cycling and Velodrome. 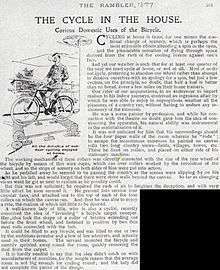 "All the delight of outdoor cycling enjoyed at home" - article from 1897 describing indoor spin. Classes generally use specialized stationary bicycles. Features include a mechanical device to modify the difficulty of pedalling, specially shaped handlebars, and multiple adjustment points to fit the bicycle to a range of riders. 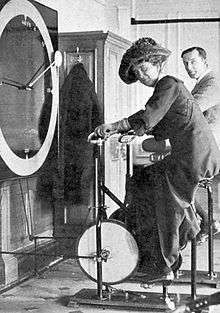 Many have a weighted flywheel, which simulates the effects of inertia and momentum when riding a real bicycle. The pedals are equipped with toe clips as on sports bicycles to allow one foot to pull up when the other is pushing down. They may alternatively have clipless receptacles for use with cleated cycling shoes. Padded shorts aid comfort and avoid the chafing caused by the sewn seams in underwear. If the exercise is not done correctly or the rider's position is bad, injuries can occur; problems with the lower back and knees are most common. To avoid injury and aid comfort it is important to make sure the bio-mechanical position of the rider is correct. Group cycling bikes have a wide range of adjustment, and it is essential to obtain the correct setup prior to riding. The seat position must be right for the participant's height. 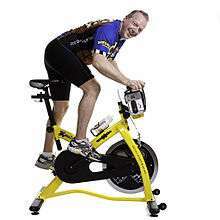 The height of the seat should be in level with the hip when the participant is standing next to the cycle. Horizontally, the seat should be set in order for the front of the knee to be directly in vertical line with the ball of the foot when the pedal is pointing forward. This results in a position where the knee is slightly bent at an angle between 25% and 35% when the leg is extended with the foot resting flat at the bottom of the pedal stroke. Handlebar height can be adjusted for comfort; less experienced riders may want to set them higher to ease lower back discomfort. A reasonable reference point is to set it in level with the seat. A typical class involves a single instructor at the front of the class who leads the participants through routines that are designed to simulate terrain and situations similar to riding a bike outdoors. Some of the movements and positions include hill climbs, sprints and interval training. A well-trained instructor uses music, motivation, visualization and enthusiastic coaching to lead students through a ride that best suits their fitness level and goals. Most instructors will lead what is called an interval ride, where students will sprint, run, climb, and jump all in the same ride, but there will not be definable pattern to the exercises. In the early 2000s, "terrain-based" classes that simulate outdoor conditions (e.g., wind resistance) were introduced. Terrain-based classes are designed to improve a rider's outdoor skill set and increase endurance while providing an intense cardio-based workout. Participants set goals based on their heart rate, which can be measured by hand or using a heart rate monitor and ride simulated variations in terrain by altering resistance and cadence. Some participants choose to maintain a moderate, aerobic intensity level, with a heart rate of between 50 and 85% of max while others drive their heart rates higher in intervals of anaerobic activity to levels of between 85 and 92%. By varying the resistance on a flywheel attached to the pedals. The resistance is controlled by a knob, wheel or lever that the rider operates, causing the flywheel brake (a common bicycle brake, a friction wheel, a magnetic eddy-current brake, a viscoelastic fluid brake, or a strap running around the flywheel) to tighten. On most bikes the brake can be adjusted from completely loose, providing no resistance to pedaling beyond the inertia of the flywheel, to so tight that the rider can not move the pedals. Usually riders who can't pedal at the resistance called out by the instructor are encouraged to ride at a level at which they feel comfortable yet challenged. By changing the cadence (the speed at which the pedals turn). Pedaling at a higher rate expends more energy than pedaling at a lower rate with the same resistance. Correct cadence is between the range of 80 to 110 RPM for seated flat, standing flat (running) and jumping and 60 to 80 RPM for seated climb, standing climb, running with resistance and jumps on a hill. Sprints are taken under hill resistance building cadence up to no more than 110 RPM. Seated sprints are most suitable as the rider maintains full control of posture at all times and will avoid falling due to exhaustion. A correct sprint should last from 10 to 25 seconds, leaving the rider exhausted in the 85 to 92% max heart rate range. There are five core movements in the Spinning programme. Seated flat, with hands at the center part of the handlebars. This is hand position one. This position should be used only when seated, for flat road simulations and during the warm-up and cool down. Cadence between 80 and 110 RPM. Jumps, (also known as lifts), a combination of seated and standing with riders hands at position two for durations of between two and eight seconds. Cadence between 80 and 110 RPM. Seated climb with hands at position two, increased resistance and lower cadence of 60-80 RPM. Standing climb with hands wide and forward so the thumb tips are touching the far end of the handlebars (hand position three). The rider is canted slightly forward so that maximum force can be exerted onto the pedals with heavy resistance and a cadence of 60-80 RPM. There are five further advanced movements based on those listed above. Most indoor cycling classes are coached with music. Riders may synchronize their pedalling to be in time with the rhythm of the music, thus providing an external stimulus to encourage a certain tempo. Often, the music chosen by the instructor is dance music or rock music set to a dance beat (i.e. 4/4 time), but not necessarily. This tends to help motivate participants to work harder than they might otherwise. The instructor also may choose specific songs for sprints, climbs, and jumps. While the music provides a tempo cue, the cadence does not need to be a multiple of the beat in order for the rider to feel in rhythm; the music therefore helps a rider maintain any constant cadence, not just a cadence that matches the beat. It may depend on the level of exertion whether or not someone changes position or the instructor can tell the class to change. A variation known as "aqua cycling" or "hydrospinning" also exists. In this, the stationary bicycles are underwater in a pool. ↑ "Spinning Information on Healthline". Retrieved 2011-02-10. ↑ Darling, A. "Be Fit: The Science of Health: Part 2: Exercise: Feel the burn: Which workout is best for you? Andy Darling is your guide." Guardian, The. 2005, January 15: 28. ↑ Landreth, Jenny (21 January 2014). 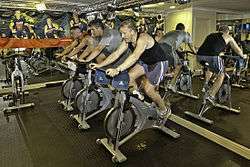 "Hydrospinning: the fitness craze that makes your spin class look easy". The Guardian. Retrieved 7 April 2014. ↑ "Aqua cycling: A new underwater workout". Fox News Channel. 29 August 2013. Retrieved 7 April 2014.